I have been seeing some creative cases for the iPad out there. This one seems to rank right up there. It’s the NewerTech NuGuard Gripstand. The interesting part about this device is the detachable kickstand / handle. You press a button on top and detach the stand ring. When you re-attach it, you can use the ring as a stand, or turn it and use as a handle for your iPad, which you can easily flip around. The shell is a hard-protective case with a shock-resistant inner lining. 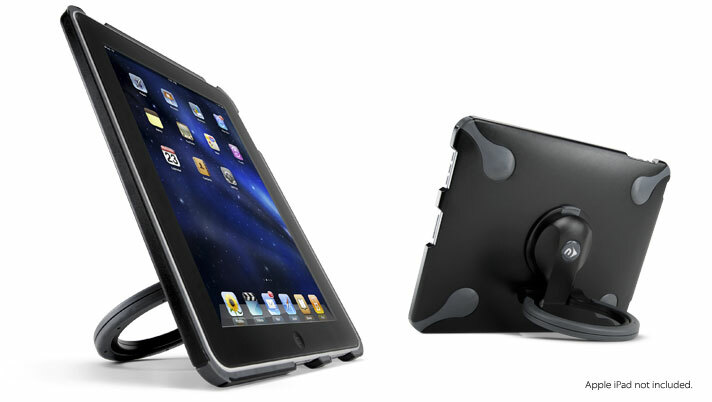 The handle swivels 360 degrees if you want to use the iPad in portrait or landscape modes. Remove the Gripstand handle and attach the Gripstand base to give your iPad a little bit of height off the table. Perfect as a Kiosk or a desktop with addition of Bluetooth Keyboard. 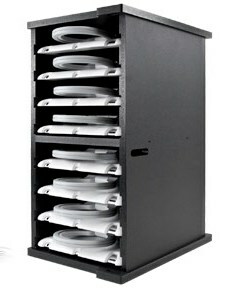 If you are getting this to use iPads in a retail environment, they also have the GripStand Station – an 8 bay charging station for your iPads. The station also has an option to sync all the iPads at once. Therefore if you have a software upgrade to perform, you don’t have to connect each iPad to different computers to upgrade. Great for an office, warehouse or even a classroom. The Gripstand comes in at $39.99, with the Gripbase for $19.99 and the Gripstand Station TBA.